HODIE 1a vice lecta est Billa, for the true making of Woollen Cloth. Eodem die, 3a vice lecta est Billa, for the Maintenance of Tillage, and Increase of Corn, que communi omnium Procerum Assensu conclusa est. Eodem die, 3a vice lecta est Billa, for the making Denizens of the Wives and Children of Edmonde Allen, John Rogers, John Madwell, and James Bylney, que conclusa est, dissentientibus Comite Derbie, Domino Sturton, Domino Sandes, Domino Wyndesor, et Domino Borough. Eodem die, 1a vice lecta est nova Billa, for the Provision and Relief of the Poor. 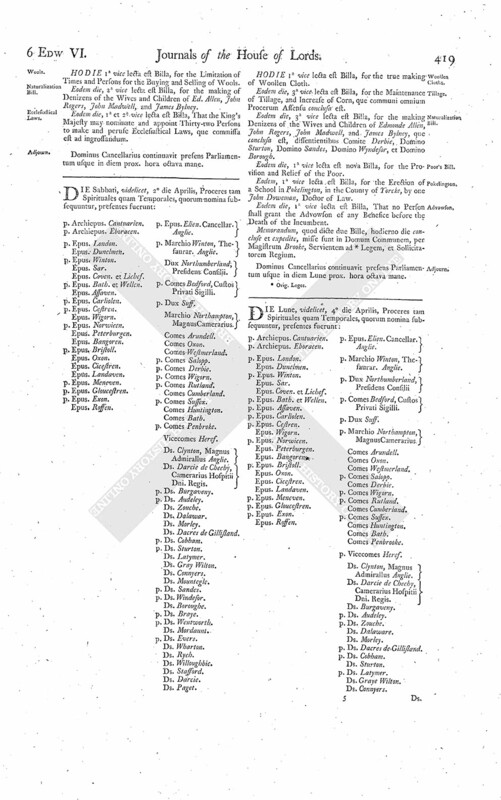 Eodem, 1a vice lecta est Billa, for the Erection of a School in Pokelington, in the County of Yorcke, by one John Doweman, Doctor of Law. Eodem die, 1a vice lecta est Billa, That no Person shall grant the Advowson of any Benefice before the Death of the Incumbent. Memorandum, quod dicte due Bille, hodierno die concluse et expedite, misse sunt in Domum Communem, per Magistrum Brooke, Servientem ad (fn. 1) Legem, et Sollicitatorem Regium.